Riding Shotgun: That’s the name of my new journal. 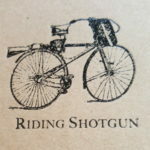 A picture of a bike with a shotgun strapped from the back wheel to the handlebars is imprinted on the front cover. A knapsack is affixed to the handlebars. Sounds threatening. Riding shotgun in the Old West meant sitting beside the driver, holding a weapon to protect the driver and the cargo he carried. This is a one-man rig. Protecting himself or is it the idea of being prepared? Is he taking off to the woods for solitude to record his thoughts, the knapsack holding his writing material, with the gun to protect him? Or is he riding along with someone else to keep them from harm? I told Jody, the owner of the store, I didn’t like the picture, but it had all the features I need, and better than the other choice, so I’d take it. I apologized for my negativity, but she’d blown it off. I wonder if she ever does lose her cool. How do people do that? Not get upset? Keep this calmness about them? I have this age thing hanging over my head. I wonder how much time I have. There are some things I will never do, some things I won’t finish. I am making my peace with God; everything else is secondary. Perhaps I’m getting tired of trying every new thing I see. Maybe I need to relax, take care of home and husband, stay calm. However . . . Opening a new journal is exciting. What happenings, new knowledge will fill this book? Sometimes as I write, I worry about who might read it after I’m gone. How will they react? My opinions are my own, as is my truth. And those can be misconstrued. That’s not my concern, really. I want to record everything that happens in this awesome, troublesome, imperfect, perfect life I live. Valuable to anyone is what is going on in the world. Think what a treasure it would have been if Grandma Mercy had written something besides the weather, and what she planted that day. She was told once to write what she knew. Good advice, but I suppose she couldn’t put anything personal down. Too revealing or hurtful. And she appeared to care very little about global affairs. That was man’s business. Three months filled the last Journal. In three months, or when this Journal is filled, I’ll see how my musings today have fit what I do. And maybe I will discover what Riding Shotgun really means.